When it’s broiling hot out, it’s not unusual to feel like you’re dragging a tractor trailer tire around with you during your workouts. And it’s no wonder. Your body is used to delivering blood to your muscles when you work out and deliver a certain amount to the skin so you can sweat. But when the great outdoors turns the heat up, you’re asking your body to deliver far more than usual to the skin. That’s like asking UPS to deliver twice as many packages without any extra resources. It’s going to slow things down. So you know the supercool thing that your body does? It makes more blood. For a few days, it increases plasma volume to better handle the demands you’re putting on it. 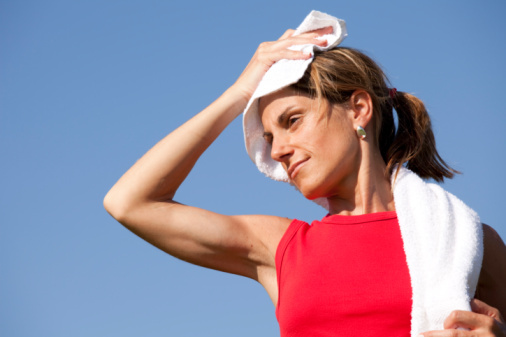 Eventually over 5 to 14 days, if you consistently work out in the heat (wisely! ), you become far more efficient at cooling yourself and will become acclimatized to the new temperatures, thanks to this increased blood flow and other complex adaptations that happen as you train in the heat. But the first couple of days, expect to feel slow. Tune in to my upcoming story on Active.com to find out more details on it (I’ll keep you posted). So how do you train when you have a big race coming up? If the race will be hot, it may be worth acclimatizing yourself by doing easy workouts out in the heat for 5 to 14 days. But if you’re trying to make performance gains with speedwork, you won’t be able to hit the speeds you need in the heat. Do those workouts in the early morning before it gets hot or take them indoors. Above all, be safe. Know how to hydrate and replace your electrolytes, and be on the lookout for the symptoms of heat stroke and heat exhaustion. Being smart about the heat gets you a lot farther than going one extra mile that puts your health in danger.